Overnight at the cozy, Saxon Lodge Bed & Breakfast, for 3 nights with 3 Shark Trips! Great White Sharks are enigmatic and powerful, perfect specimens of evolutionary success. The mere image of them summons up the most primal and intense emotions. In South Africa, Great White Sharks come close to shore, which allows us to safely introduce them to you. Shark Cage Diving remains a niche and unique product, one which more and more people have at the very top of their Bucket Lists. Exceptional, professional and personalized service coupled with extensive industry knowledge make Dive the Big 5 the sustainable choice for a once-in-a-lifetime experience that will captivate your imagination! Whether you venture out from Gansbaai or Simon’s Town, are a diver or non-diver, your experience is guaranteed to blow your mind. The vessel, SHARK TEAM, is a 36-foot custom-built Catamaran, she can take 36 passengers, but we limit ourselves to 20 participants and 5 crew members, giving you more comfort and space as well as a more intimate experience. From the harbor to the diving location, is about a 15-minute boat ride. Once we arrive, we will drop anchor, scent the water with fish chum and wait for the sharks to arrive. As these nomadic creatures are wild and free, and every trip is unique, we never know what to expect until we arrive. While we await the sharks’ arrival, you will receive detailed instructions on how to cage dive. All diving equipment is supplied, including 7mm thick wetsuits. We have 3 complete sets of wetsuits, which ensures that you receive a clean and dry wetsuit. As the first dorsal fin breaks the surface, the first group of divers will enter the cage. 6 Divers are in the cage at a time and spend approximately 20 – 30 minutes in the cage. Some clients prefer to stay on deck, which is not a problem as they will still enjoy spectacular sightings of the sharks, without having to get wet. Great White Sharks are curious creatures, some even spy-hop like whales do and you can see them perfectly from the comfort of the boat. Even though you have come to see the majestic Great White Shark, along the way we may encounter some of the other members of the Marine Big 5 – dolphins, seals, whales, penguins – and we have other visitors to the boat too, such as inquisitive Stingrays! The experienced and able crew’s number one priority is the safety of our clients. They have all undergone intensive and continuous training to ensure the ultimate safety of all on board. Our Marine Biologist loves to chat and enjoys sharing his passion and extensive knowledge with our clients. Some of crew have over 15 years of experience in the industry, so you are in safe and knowledgeable hands. On board, we have packed some picnic snacks to keep you sustained through all the excitement. These snacks include a variety of sandwiched, fruit, crisps, water, juice and soft drinks. Upon arrival back at the lodge, you will be welcomed with a light lunch. Hot showers are available to freshen up. We have no doubt that after having spent 6 hours with us, you will leave feeling inspired and invigorated, with a new sense of respect for sharks. The aim is to turn every participant into a shark ambassador and fin-protector. 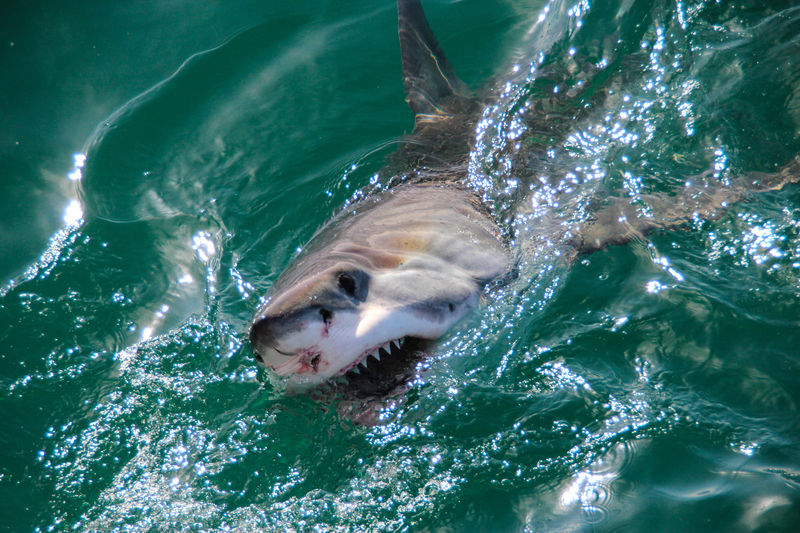 The above morning’s itinerary can be extended to as many days as you like, including overnight accommodation, on a bed and breakfast at Saxon Lodge in Gansbaai, depending on how many mornings you want to spend with the Great White Sharks. For trips out of Simon’s Town, complete Cape Town services can be arranged. ** Don't even think about leaving South Africa without doing a land-based Big 5 safari! Let us customize your lodge stays.